There are thousands of different Match-3 and Match-4 puzzle games out there. These are taught to first year game programming students. It’s simple, it doesn’t require a slew of artists working for months. It’s really common and is in desperate need for innovation. Does Swivel bring a refreshing spin on the puzzle game genre? Does it stand out? 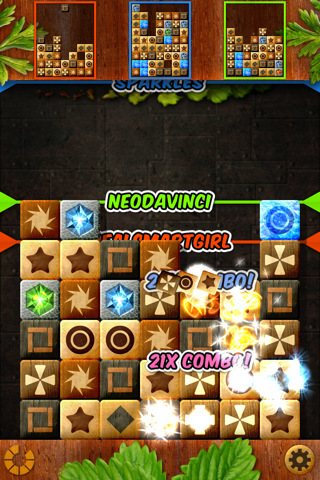 Released by Gallant Games, Swivel is a match-4 puzzle game and it is available on the iPhone, iPod touch, and iPad for $0.99. So blocks drop down from the sky and you rotate groups of 4 blocks to try and match at least 4 together. When matched, blocks will glow and then explode a second later. You can spin other blocks and add to a match for even more points and extend how many blocks will disappear. You have a few special blocks that block or help your strategies by freezing blocks or exploding them. You can also record your high scores through Game Center. There really isn’t much else. Multiplayer is ok, sound design is ok, difficulty and strategies are modestly challenging and overall ok. Nothing stands out by being either bad or good. I mean, the game does feel well done for a few games but very quickly you will realize that there is nothing memorable about it. Bejeweled if flashier and more addictive for its fast pace. Drakolanche brings out the avalanche system and features a cute dragon that destroys things. Swivel is just a Good, not great, game app. Maybe you’ll really like it, maybe not. It’s worth a try though. I feel like this is an app that has a 50-60% chance of winning the player over. I just wasn’t one of them. 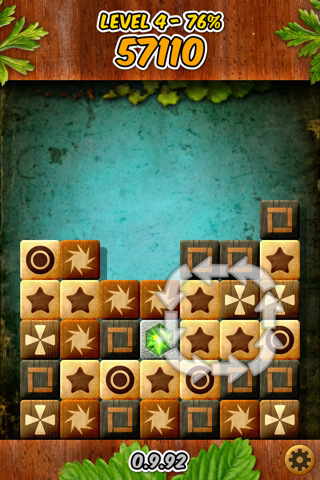 AppSafari review of Swivel was written by Joseph Ho on March 9th, 2011 and categorized under App Store, Games, Puzzler. Page viewed 3578 times, 1 so far today. Need help on using these apps? Please read the Help Page.